Hey Blainreaders – this is the 100th edition of the Blainletter. I guess that's something to celebrate! Thanks for reading, following, friending or otherwise lending some support and encouragement for my musical adventures. So here I am promoting my upcoming gig at the Old Mill Home Smith Bar. THIS SATURDAY NIGHT, Mar 10, I will be joined by Larry Kurtz and a couple of Blackburn Brothers. Larry is a longtime collaborator (here we are at the Tremblant Blues Festival) and the Blackburns are carrying on a great family tradition on the Toronto music scene. In addition to my "residency" at the Old Mill, I'm happy to report I've been engaged for a house concert in April and a festival in June. And I expect there will be a few more gigs trickling in. 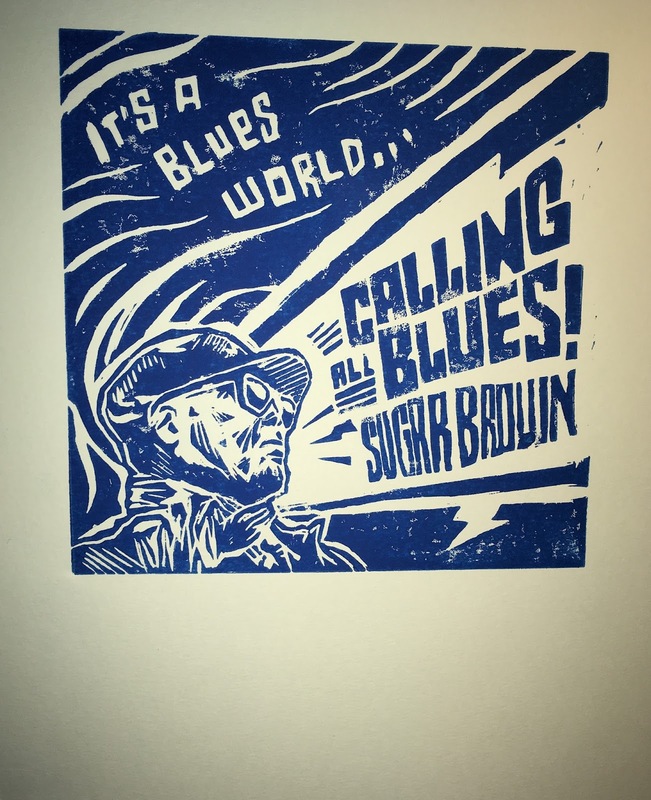 This is the first year in a long time that I have not attended the Toronto Blues Society Guitar Workshop (I even hosted it a few years back). I have been transportationaly challenged so this time I had to be satisfied with a few Live Facebook clips to give me a little taste. I had just seen Dan Mackinnon at the Aurora Winter Blues and he was hosting the workshop and looked like he was doing good and asking the right questions. Dan is a blues-rocker and I did a double-take when I saw he would be opening for the Mad Dogs and Englishmen at Aurora where It was a pretty "mature" crowd. If you remember Joe Cocker and that musical travelling circus back in the 70s, then you probably qualify as a "mature" music lover. It was great hearing blues belter Cheryl Lescom who reminds me of the great Kathi MacDonald (who toured with the original Mad Dogs and who I had the adventure of touring with before she passed away). Aurora Winter Blues was the same week-end as the Cold Weather Blues but they were two different kind of events, though both featured top-notch local blues talent. Aurora was in a beautiful "soft-seater" setting (on the campus of the upscale St Andrews's College) with an appropriate ticket price while Cold Weather is a no-cover club crawl in the Beaches (Queen St East) with 10 or 12 blues bands. At the Cold Weather Blues Fest I got to hear Connor Gains and Jennie Thai, a couple of young players who are making a buzz on the local (and national) scene and stretching the boundaries of the blues. Then I happened into a crowded upstairs room and saw a bunch of old friends - Clint Ryan, who was one of the first musicians I met in Toronto and his longtime bandmate Rob Sagar (who glued together my old Epiphone guitar the first time the headstock broke off). Here were two guys who have been playing together for their whole musical life and they were jammin' with with the fabulous Burgess Brothers, Tyler and Chris, who have been playing together for their entire lives, I guess. The House was rockin'. Sugar Brown (who is killing it on guitar these days) and his Blues Army Michelle Josef, Russ Boswell, Jesse Whiteley and Jon Wong. Montrealer Bharath Rajakumar was flying in for the Saturday night but that was my night in Aurora so I missed out on this amazing harp player. I'm sure it was a great night! 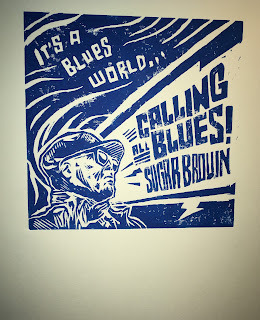 Ken ("Sugar") was kind enough to give me an original lino-print of the artwork for his forthcoming CD (being launched at Hugh's Room on March 21 with the added benefit of a double bill with Ray Bonneville). Like the Winterfolk festival, they have their share of niggly neighbours, so most of the venues quit the music at 11pm. At Winterfolk, one of the official venues (Terri O's) pulled the plug on the first night due to noise complaint from a neighbour. We’re a long ways from being a “music city” when even a folksinger is too loud and annoying for some residents. It was great to see Mose Scarlett who hasn’t been playing around for 2 or 3 years and hearing new tunes from old friends (and old tunes from new friends:-) Discovery of the week: 15-year olds Moscow Apartment. Here's a little compilation video of some shows I saw at Winterfolk. 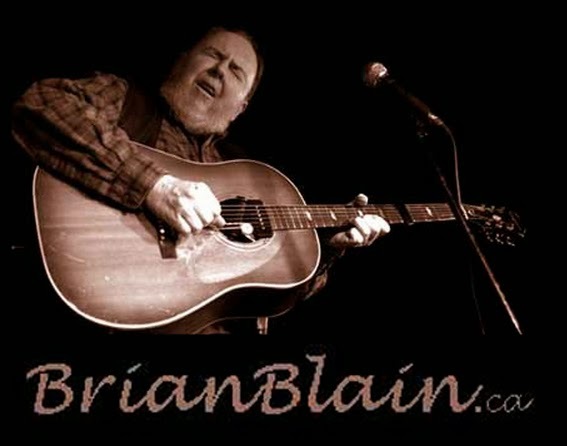 I mentioned in the last Blainletter that I had moved the brianblain.ca domain to the same provider for all the domains that I manage. Big mistake. Both website and mail were screwed up for a week. If you were trying to contact me in the last couple of weeks at brianblain@brianblain.ca you may have got a bounced message. I've been suggesting people use my gmail: brianblain@gmail.com. Now both my .ca and .com are pointing to the same (incomplete) website. But as I write, my devoted son is upstairs trying to get it operational. Thanks, Joel (not sure if he reads the Blainletter :-) It never fails. Every time I try to tidy up things (paper or digital) it never fails that a little while later I'll be looking for something that I've purged. As I was writing this Blainletter, I had the 90th Anniversary Oscars playing on the iPad – it was fun watching but the musical segments were underwhelming until the last one, a powerful performance of The Greatest Showman's "This Is Me" by an artist I never heard of, Keala Settle. The audience went crazy if only because there was finally a little musical energy coming off the stage. Mark Stafford, who I had a chance to play with at the Campfire and also the Southside Shuffle, was one of the artists who worked on the set for the Best Movie of the Year, The Shape of Water and the whole Toronto crew was celebrating at the Palais Royale. Way to go, Bird!